"This is my Dad's famous recipe. He used to make it for my sister and I when we were little and we both loved it! Use kosher hot dogs for the best flavor." Pour the beer into a saucepan, and bring to a boil. Add hot dog slices, and cook for about 5 minutes, until plump. Drain and discard beer, leaving hot dog slices in the pan. 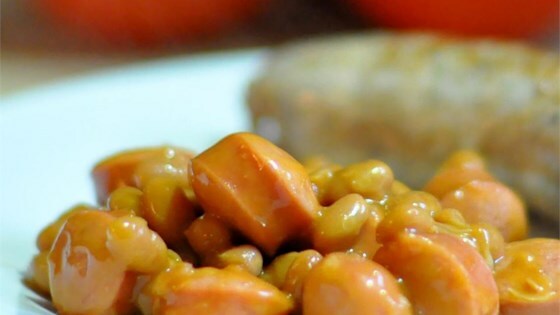 Stir in the baked beans and honey. Simmer over low heat for 15 minutes, stirring occasionally. Learn this new technique of cooking steak! Wonderful flavour. Following the advice of previous reviews, I let the hot gogs simmer for about 10 minutes and added a little ketchup. Had never tried beer in beanie weenies before; felt the need to simmer longer. Came out great. Thanks! It was a can of beans mixed with some hotdogs. I don't really see what the beer or honey added. Sorry. I love Beanie-Weenies from when I was A kid and still do to this day and boy were these good. I don't feel as if the beer and honey added any flavor to this recipe. I'm giving it 3 stars because it still tasted good.